Every year we like to travel to a European city for a Christmas market. This year we decided on the Bavarian city of Munich in Germany. 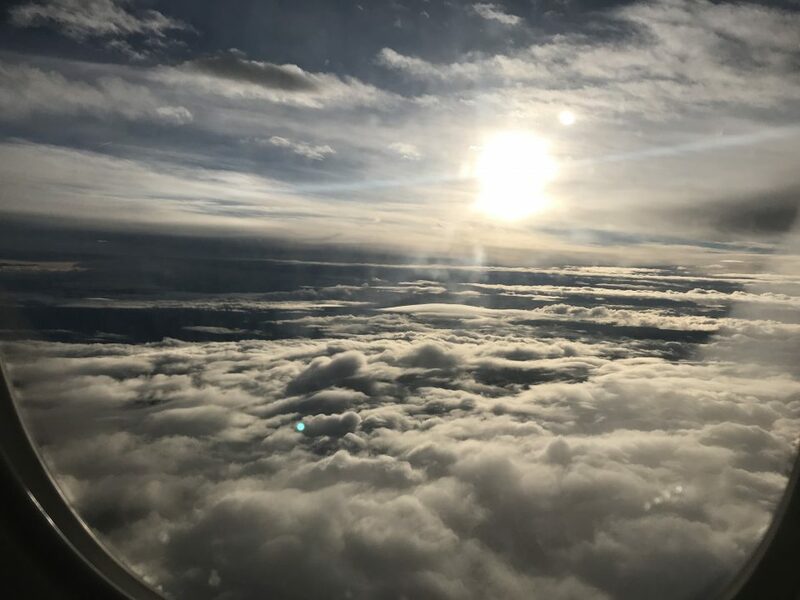 We were particularly looking forward to our trip after visiting Christmas markets in Zurich, Krakow, Prague, Dresden, Vienna, Salzburg and Sopron in previous years. That list should impress anyone! We left Swansea bright and early for our short journey to Cardiff Airport. I hadn’t been to Cardiff Airport for about 10 years as we normally fly out from Bristol for our adventures. It seems that quite a bit of work has been done at Cardiff Airport since the time we last flew from there. I was very impressed with the facilities now on offer. We made use of the executive lounge which offered a variety of Welsh food and drink including Welsh Brew tea, Penderyn, Merlyn and most importantly Glamorgan Beer. Our Flybe flight left without delay and the journey to Munich only took around 90 minutes. After checking in at the hotel in Munich, and picking up some essential supplies in the local supermarket (not beer) it was already getting dark. This didn’t stop us setting out to see a little bit of what Munich had to offer before going to bed (this was beer). Not far from the hotel we arrived at Karlsplatz. 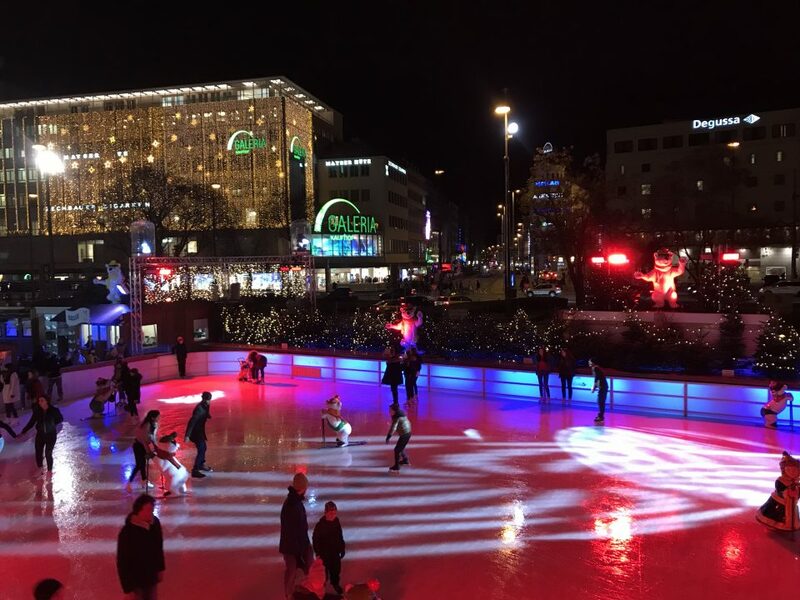 This was not only the location of Munich’s Winter Wonderland and a giant ice skating rink, but also a place where I paid an extortionate €7.50 for a Glühwein. Krampus will eat your souls! Maybe due to the influence of Krampus or generally being on Santa’s evil list, the wife had a funny turn in the Winter Wonderland. Ruling out her being possessed by evil Bavarian ghosts or Jurgen Klinsmann, we thought she just needed something to eat. We did not know what we were letting ourselves in for! Near Marienplatz we found a restaurant and bar called Augustiner Klosterwirt. 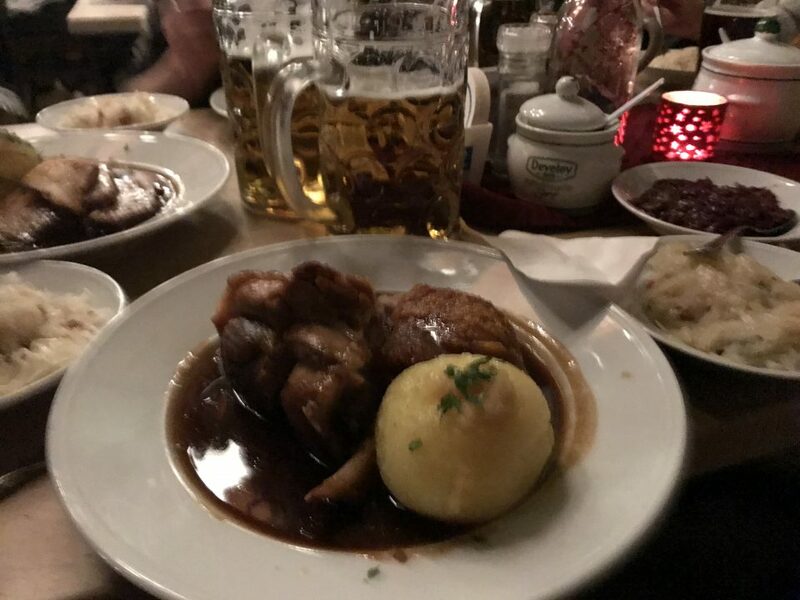 Most of us made the mistake of ordering a large beer which was in reality a gruelling two pint stein. But we struggled on and finished it for the good of humankind! For food I ordered pork knuckle with dumpling and sauerkraut. It was delicious but like the drink we ordered it was huge! I failed miserably in consuming it. By the time we admitted defeat with our food we still had most of the aforementioned giant drink left. So before heading off for bed, we listened to the legendary tales of the parents while a mystery person let off foul wind at our outdoor table. We are looking forward to our first full day in Munich tomorrow to really discover the delights of the city.